The landscapes in Thy varies between flat, sandy dry and moist areas and small hills of limestone. 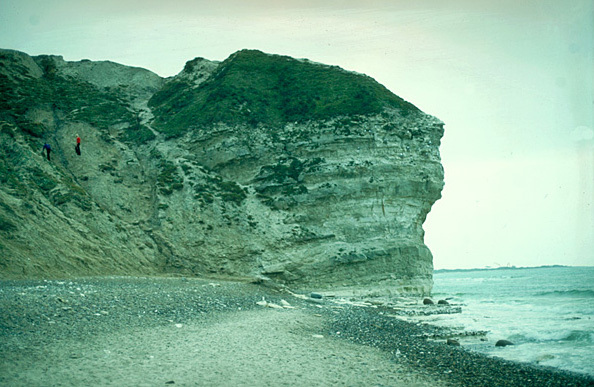 The limestone hills are often partly or entire covered with sand blown up from the North Sea. Out to the North Sea the limestone hills become exposed and are eroded by the sea to create cliffs. 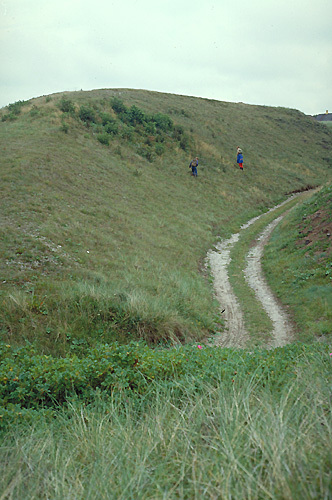 This can be seen at Bulbjerg (picture to the left). On the steep slopes of Bulbjerg a lot of birds are nesting. This includes Kittiwake (Rissa tridactyla) and recently a few Fulmar Petrel (Fulmarus glacialis) has started to breed. Bulbjerg is also famous because of the plant-life. Small canyon through a limestone hill at Febbersted near Hanstholm. The limestone is partly covered with sand blown up from the sea and the flora is extremely rich with several species of rare plants. The canyon has recently been cleared from trees and shrubs.